We won’t even try to give you an answer to the question of what platform you should start from – iOS or Android? Everybody knows the answer. You should start with iOS and then convert iOS app to Android. There is one very significant reason for iOS app to Android app porting: you will make more money on the App Store. But once the iOS version of your product is doing well on the market, make sure you plan version for Android as well. If you fear Android market fragmentation, have some concerns about app development costs, or think that an Android app will fail to bring you the ROI, here are some thoughts we’ve put together to persuade you that Android app development isn’t as scary as it seems. iOS is more popular than Android in key Western markets including the US, the UK, Denmark, Australia, Canada, and Ireland. Even though Google’s Android remains the dominant leader globally, most entrepreneurs start their application development from the iOS platform because they’re targeting markets dominated by Apple’s App Store. The target market for an app depends very little on the geographical location of the startup or the location of app development. Smaller startups – and even some larger companies – prefer to target Western markets with their iOS apps even if they are based somewhere in Eastern Europe or Asia. It is well known that European and North American markets support stronger app sales and more in-app purchases, meaning higher average revenue per user. However, there are other target markets where it may make sense to start with Android, not just port iOS app to Android. Europe and North America get a lot of attention, but there are vast markets around the world that have a lot of potential. 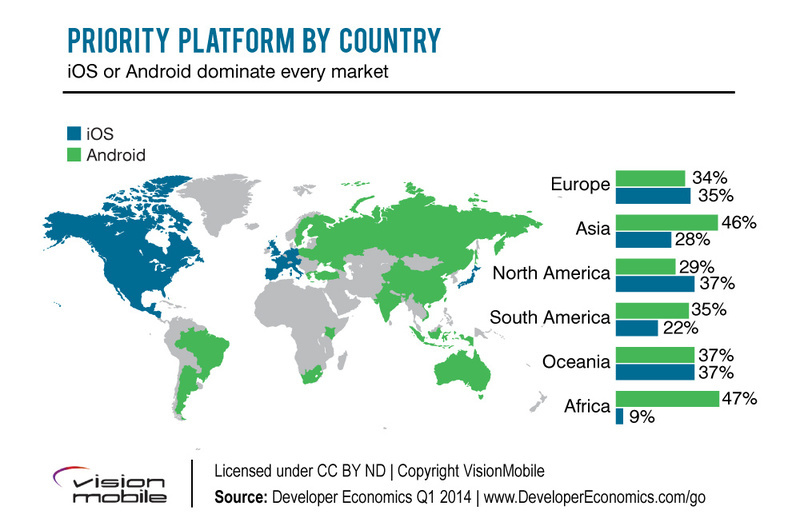 Countries where Android currently dominates include Mexico, Brazil, Saudi Arabia, China, India, and South Korea. However, iOS to Android app converter would be valuable not only in some particular areas. If you are based in a small market and need to scale fast, then you should consider international expansion among your top business objectives. For developers who want to greatly incresase their user base, it is a key strategy to port iOS to Android. For developers who want to greatly increase their user base, porting an iOS app to Android is a key strategy. With a large user base, you have more monetization and investment opportunities no matter what device your customers use. Perhaps the majority of people who aren’t Android developers truly believe that developing for Android devices is a huge pain. In fact, it isn’t. While it’s true that the market of Android devices is huge and diverse, Google has tackled the fragmentation issue by giving Android developers tools that allow us to specify different UI layouts for different screen sizes and handle pixel density elegantly. Google has been supporting different Android layouts from day one. We can have as many layouts as we like while keeping the same codebase. The current Android SDK version supports about 20 resolutions. But in general, there aren’t that many different screen sizes to consider – only about ten resolutions are in active use. We can simply ignore some of the older versions of the Android system when we port an iOS app to Android. After all, users of Android 2.x and Ice-Cream Sandwich (version 4.0.3-4.0.4) amount to only about 3 percent of the market, and users of these older versions are quite unlikely to pay for an app anyways. When you port an iOS app to Android, you should make sure the app supports KitKat (version 4.4.) 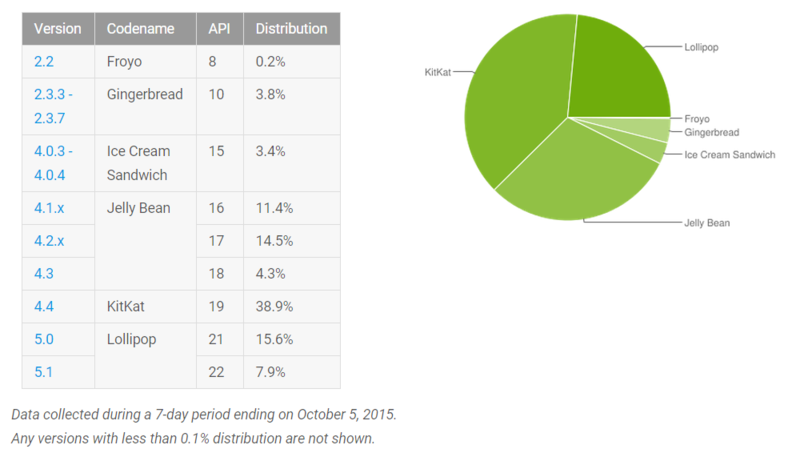 used by 36 percent of Android owners, Lollipop (version 5.0-5.1) used by 33 percent of users, and Marshmallow. Currently, only the Nexus 5X and Nexus 6P are running the latest Marshmallow version, which amounts to 0.7 percent of the market. But these people are most likely to spend money on your app. In some areas, it would also make sense to offer support for Jelly Bean (version 4.1.- 4.3. ), but do some market research to make sure this will pay off. As you can see, fragmentation really isn’t as bad as some make it out to be. But what’s even more exciting, we can spend just as much time to convert Objective-C to Android code. This might surprise you, but it’s true: the cost of native Android app development is roughly the same as the cost of building an iOS app. As we already pointed out, a simple look at data provided by Google can help you make a rational decision about which Android devices and versions of the OS to focus your energy on first. The fewer devices and Android versions you support, the less time it’ll take to develop a native Android app. Since the amount of time it takes to build an app has a direct correlation with cost, less time equals less money. You can easily find out which phones and tablets your target audience owns by analysing the traffic from your app’s landing page and talking to your customers directly. With all the necessary data on hand, concerns about cost and complexity of native development for Android are not so pressing. If you are concerned about the resources required to test and support your Android app once it’s launched, then fear not. At Yalantis this is not an issue. We have all the latest and most popular Android devices in-house, and offer ongoing support and bug fixes for all our clients. Another great advantage of Android is the speed and ease of getting an app on the Google Play Store. Approval times are much faster than the App Store, meaning releases without delay. Remember how long it took you to publish your app on Apple’s App Store? Two weeks on average. And Apple always makes you wait to roll out updates. Google doesn’t. On Android, you can push 3-4 fixes daily. Isn’t it great to deliver regular updates to your users more quickly? Now, converting iOS application to Android doesn’t sound terrifying at all. But let me provide more arguments in favor of Android. Apple’s App Store still brings in roughly double the revenue of the Google Play Store. We can’t argue with the numbers. But on the other hand, the potential for revenue is beginning to shift in favor of Android as the operating system gets more popular around the world and the quality of Android devices and the Android OS improves year over year. But until the average quality of Android devices improves, we can actually use the flaws of Android to our own advantage. There are some mobile app features that are rather hard to implement on Android. For example, if you want to port your video editing app to Android, you will have to deal with a lot more complexities than on iOS. This is because the cameras on many Android devices lack the capabilities required for advanced video recording. Also, there aren’t many Android libraries that support cool video editing features. While you might spend more money developing these features for Android, your solution will also be more novel. Because there is little competition on the video editing app market on Google Play, you can put a price tag on your app. Google now allows you to create promotions, which means you can give users a paid app or in-app product for free with a promo code. This is a great way to attract more people to the unique functionality that your app offers. You can read more about implementing video functionality on Android here. With or without editing features, video functionality is a great source of advertising revenue. According to the latest report by Opera Mediaworks, video-ad impression share has increased sixfold in just one year. Interestingly enough, mobile users in the U.S. view more video ads than mobile users in any other country. 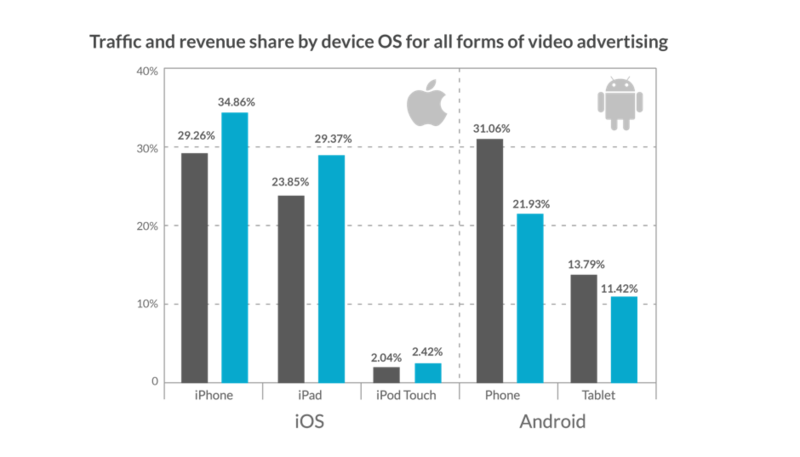 Another positive trend noted by Opera Mediaworks is that in the first quarter of 2015 Android generated 45.8 percent of ad revenue compared with 45.4 percent for iOS. This was the first time Google outperformed Apple in advertising revenue share. You should keep in mind that most reports don’t include Chinese Android app stores. Google Play is banned from the Chinese market, but people still download Android apps from other stores. Recent rumor has it that a Google Play Store that complies with Chinese censorship rules will launch in China after the Chinese New Year in February. Entering Chinese market is a very significant reason for application porting to Android. When you convert your iOS app to Android, you should pay close attention to unique possibilities of the Android platform as compared to iOS. There are some Android-specific features that you can use to better engage your users. After all, to convert iOS app to Android doesn’t only mean to transfer iPhone app to Android. What it means is creating great experience for users of the Android platform. Android has been allowing users to put widgets on their home screens for years. A widget offers a great opportunity for user retention. It lets users quickly access the app, luring them with useful information. A news app, for example, can display the headlines of new articles from a category a user subscribes to, or a task-management app can have a widget that displays tasks due today. If the information that comes with a widget is valuable enough, you can even sell your widget among other in-app purchases. In this case, converting iOS app to Android comes with added monetization opportunities. iOS apps surely have them too, but there is a significant difference. Android push notifications don't light up the screen to let everybody near you see what an app wants to tell you, nor do they display on the lock screen. What’s more, Android allows you to put more symbols in a single push notification. By pushing a back button, Android users can navigate through their history of pages, apps and menus. This means that when a user left a checkout page in your shopping app, for example, they can come back there and finish their buying process. On iOS, if you leave the page pushing a home button, you leave the app. An intent is a messaging object that you can use to request an action from another app component. To put it simply, an intent is a dialog asking users what app they would like to use to complete the intended action and if they would like that app to handle all such requests in the future. For example, Android can ask users to use a document editing app whenever they want to open a downloaded document. Intents know what other apps are installed on a user’s phone and what activities are currently going on. Implementing intents is easy: we just need to register intent filters to let the OS know what your app can do and with what kind of data. The Android platform is very customizable. If your users love your app, they can set it as a default. This happens a lot with messaging apps. Check out: how to build a messenger like WhatsApp. There are lots of Android smartwatches on the market that Android users can afford. But most importantly, Android Wear now pairs with both iPhone and Android. There are also more possibilities for watch face customization on Android Wear than on Apple Watch, and Android Wear battery life is typically longer. To conclude, Android is a great platform to port your app to. We wouldn't point out what platform to develop mobile applications on or advise that you start with both platforms simultaneously. We wouldn’t advise that you start with both platforms simultaneously. In fact, we would suggest that in most cases you follow in the footsteps of other startups and launch your app on iOS first. But once you get some success with iPhone users, you should hurry up to make Android people happy too. We’ll help you port your app from iOS to Android and double your success.